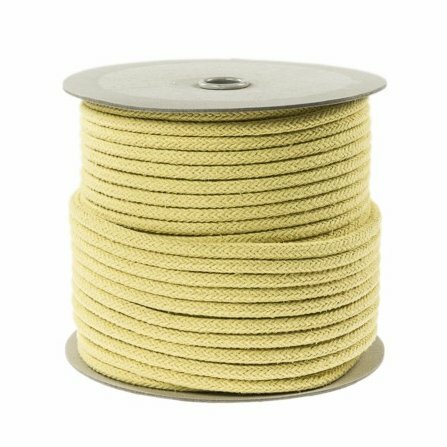 FlameShieldä high temperature and heat resistant Kevlar braided rope is a strong rope for industrial use. Not suitable for pully and continuous flexing applications. Should be protected from UV light. Kevlar products are difficult to cut due to their strength. Regular or heavy duty scissors can sometimes cut these materials, but often fail quickly as the Kevlar quickly dulls the cutting edge. Kevlar Shears are specifically designed to cut Kevlar, and feature a serrated blade so that the fibers don’t slip while cutting, holding the fiber in position and allowing for a greater shear force to be applied by the opposing blade. These shears a Extra Heavy Duty, and can be used for other materials such as cutting steel wires and steel tie wraps.